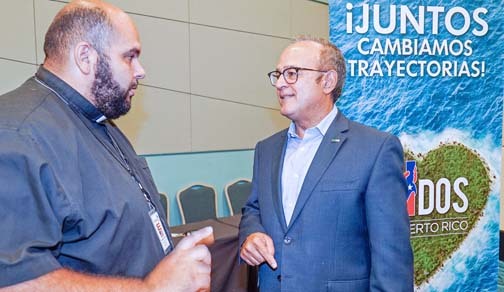 Pastor Edwin González, representative of WaterSteps, chats with Aurelio Alemán, president of United for Puerto Rico. United for Puerto Rico, a private nonprofit created after Hurricane Irma, announced the award of $481,000 in funds to four local nonprofits: La Perla de Gran Precio, Banco de Alimentos de Puerto Rico, Centro de Ayuda Social, and the National Puerto Rican Leadership Council Education Fund. Hogar La Perla de Gran Precio located in Bayamón, provides shelter for HIV women with mental disabilities. Programa Tu Casa Valley in San Juan, a program offering 10 housing vouchers for people with physical or mental disabilities. In addition, Banco de Alimentos de Puerto Rico, member of Feeding America, providing food for the past 29 years to children, sick, disabled and homeless people with socioeconomic disadvantages, will be receiving a $100,000 grant to deliver food to communities affected throughout the 78 municipalities in Puerto Rico. Banco de Alimentos de Puerto Rico’s mission is achieved through a network of nonprofit organizations and local churches affiliated to the institution, responsible for the distribution of food and provisions to individuals in need. The third beneficiary is the Centro de Ayuda Social which has been granted $48,000 to establish 13 kitchens which will be providing close to 800 daily hot meals to communities on severely damaged towns on the north coast, from Manatí to Loíza. Part of this grant will be used to purchase the generator to guarantee the safe keeping of food and supplies to be used on a daily basis. Lastly, the National Puerto Rican Leadership Council Education Fund and its project Operation Oasis will receive $233,000 to supply drinkable water solutions to the 78 municipalities. This is a collaborative project between the NPRLCEF and WaterStep, an international nonprofit that provides safe water to communities in developing countries. With more than a decade of missions in India, Asia, Africa and Central and South America, WaterStep, provides aid by creating local partnerships in devastated areas to bring safe water and healthy practices to communities in need. “United for Puerto Rico’s mission is to provide assistance to individuals and small businesses devastated by Hurricanes Irma and María. Our commitment is to help them and as a direct result we will be helping Puerto Rico to get back on its feet. We are deeply grateful to those individuals and companies that have contributed to the recovery of the affected communities,” said Aurelio Alemán, President of United for Puerto Rico. For more information about United for Puerto Rico visit www.unidosporpuertorico.com. Donations can be made by PayPal; ATH Móvil dialing (787) 552-9141; ATH Móvil Business using pATH UnidosPorPuertoRico; wire transfer to Unidos por Puerto Rico/United for Puerto Rico, Account Number: 0108501910 at FirstBank Puerto Rico, Routing Number: 221571473, SWIFT:FBPRPRSJ. United for Puerto Rico is accepting proposals for consideration at: www.unidosporpuertorico.com. Petitions will be evaluated and approved, on a weekly basis, by the Board of Directors. “We invite nonprofit organizations to send their proposals so that we can continue to help Puerto Rico,” Alemán concluded. Hey Buddy!, I found this information for you: "United for PR awards 1K in funds to 4 PR nonprofits". Here is the website link: https://newsismybusiness.com/united-awards-nonprofits/. Thank you.